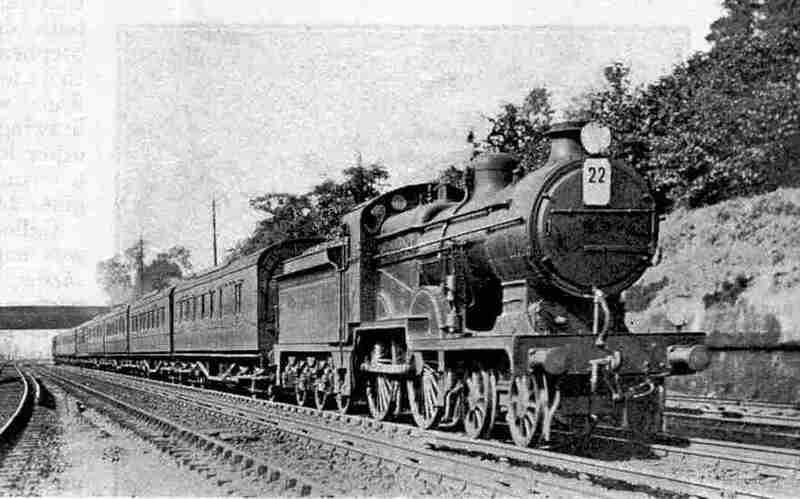 The “Kent Coast Express” passing Bickley, hauled by a 4-4-0 “L” class locomotive, No. 487. LAST month we travelled from Victoria Station, London, to Newhaven by the Southern Railway Company’s “Newhaven Boat Express” and this month we are to investigate another of this company’s London-to-the-Coast services. Victoria is again our starting point, and we shall find our train at the platform against the wall dividing one half of the station from the other. The train was for many years known as the “Granville Express”. This was a relic of London, Chatham and Dover days, when special services were instituted in connection with certain hotels on the Kent Coast; but of recent years the title has fallen into disuse. The name “Kent Coast Express” is applied to a good many trains. On a summer Saturday, indeed, such trains follow one another at roughly 10-minute intervals the whole livelong day, together making up a long-distance service that is probably without parallel in Great Britain or in any other country. But the particular train that I have in mind, and the best of the day with one exception, is the express due to leave Victoria at 3.15 p.m. This is booked to run the 74 miles to Margate without a stop in 97 minutes. The only faster service - except on summer Sundays, when the “Thanet Pullman Limited” is booked to do the journey to Margate in 90 minutes - is by the “City Express” leaving Cannon Street at 5.6 p.m., but the four minutes’ less time taken in the latter case is more titan counterbalanced by 21 miles shorter distance and, in the early stages, an easier road. We find a corridor train at our disposal. It has in the centre the ubiquitous first-class Pullman car, vestibuled to the coaches on either side, so that everyone who desires it may be served with tea or refreshments en route. There are two “composites”; a third and a third brake behind the Pullman; and two composites and a third-class brake, with probably an additional third at this time of the year, in front, making a total of eight or nine coaches. This adds up to a “tare” of between 260 and 300 tons, and a full weight, with passengers and luggage, of between 275 and 320 tons, It may not seem an enormous figure as compared with what is hauled, say, by a “Lord Nelson” on one of the Dover Continental trains, but it is a very heavy load in proportion to the type of engine employed. For it has been necessary, up till now, to restrict the working over the Kent Coast route to 4-4-0 engines, owing to the weakness of certain bridges; and, what is more, to engines whose total weight does not exceed about 50 tons, without their tenders. The locomotives generally used on this section are therefore the “rebuilt” 4-4-0 engines of the “D.1” and “E.1” classes. 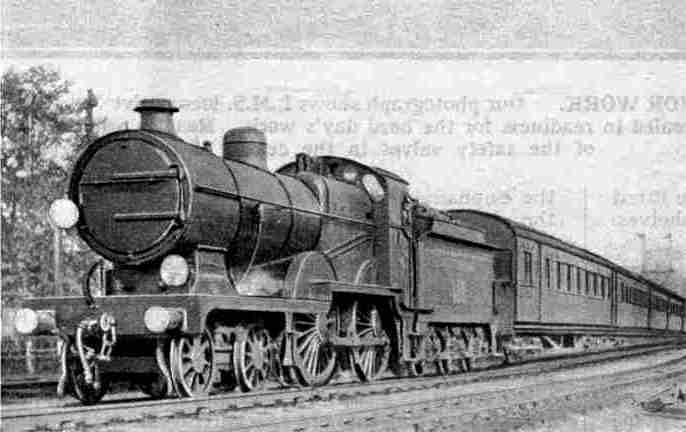 It was by a very skilful feat of design that Mr. Maunsell, hampered by the severe weight restrictions of this route, superheated and thoroughly modernised the Wainwright 4-4-0 locomotives, and at the same time materially increased their tractive power, with practically no addition to engine weight. It is sometimes difficult at first to distinguish engines of this type from the more recent “L.1” class 4-4-0’s used on the Folkestone and Dover services. The latter, which are considerably more powerful locomotives, have chimneys of bigger diameter, cabs with side-windows, and a more “thickset” appearance altogether. In view of the extraordinary' difficulty of the gradients, our driver will have his work cut out to keep time, unless we have a clear road and a reasonably fine day. Getting away punctually at 3.15 p.m, we have, as was the case last month, to mount the steep incline to Grosvenor Road Bridge, but this time with a 0-6-0 or 0-4-4 tank engine usefully assisting us in rear. Coming out of the other side of Victoria is the 3.15 p.m. Eastbourne express, very probably hauled by a 2-6 0 locomotive. This is yet another Southern wheel arrangement for express passenger trains, and one capable of remarkable speed, too. as I proved on this very Eastbourne train a few days before writing the present article; we kept up a sustained 73 miles an hour past Haywards Heath. With equal loads, however, and our two engines to his one, we shall probably overhaul the Eastbourne people before we have cleared the Thames. Immediately afterward we take divergent tracks and see each other no more. 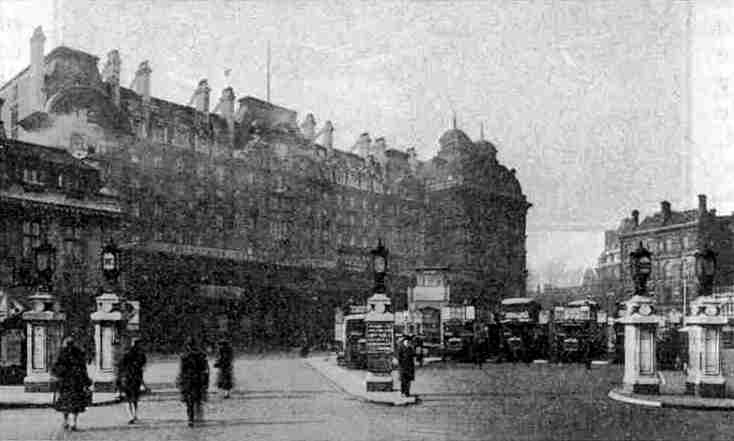 The entrance to Victoria Station, the “ gateway to the Kent Coast.” Part of the space in front is an omnibus station. There are some sharp undulations through Brixton to Heme Hill which, since the rearrangement of its layout, we may now pass at 40 miles an hour. This is fortunate, as now we have to begin the stiff climb at 1 in 95 to Sydenham Hill, up which we shall drop to 30 miles an hour or so. We see the towers of the Crystal Palace, but under the ridge that carries that structure we are to tunnel. As we enter the mile-long bore the grade changes again, and we hurry downward through Penge and Kent House to Beckenham J unction. Between the last two stations some important engineering work is now being carried on, including the raising of two underline bridges and the realignment and regrading of the tracks, which will enable the service slack hitherto enforced here to be cut out. This will be an advantage, as the rise beyond Beckenham will then be taken “at a run”, and time economised. Soon after passing Shortlands the 1 in 100 ascent recommences, and continues on through Bromley to Bickley. Here, at Bickley Junction, we part company with the electrified lines, which diverge to the right for Orpington Junction, where they join the old South Eastern main line on its way from Charing Cross to Folkestone. Now that he has got clear of the congested suburban zone the driver doubtless feels that he can breathe more freely, and so he “opens out” over the switchback, though easier, length to Sole Street. We may have taken from 25 to 27 minutes for the first 14 miles to Bickley Junction, but it is possible at last to get into speed. We swing down the short descent to St. Mary Cray, touching for the first time 60 miles an hour, and slightly exceeding this rate, probably. Then we climb to Swanley at a minimum of about 50, and develop some high speed on the falling grades thence to Farningham, reaching from 70 to 73 miles an hour here. From Farningham we have to rise steeply to Meopham, passed at about 45 miles an hour; and then, at Sole Street, we are faced with the worst bank on the route. Fortunately it is in our favour - its four miles right off at 1 in 100 is a serious handicap for up trains - but owing to its winding character, we cannot take proper advantage of it, and over most of its length we shall run at under a mile-a-minute. Down the lower part of the hank a magnificent view opens up on our right of the winding reaches of the River Medway, with the great Portland cement works that line its banks. The fine lattice-girder bridge, by means of which the “Kent Coast Express” crosses the Medway at Rochester. The photograph was taken from the top of Rochester Castle. We now bend round to the right by a long and very sharp curve, with Rochester Castle here a prominent object above the opposite river-bank, as a preliminary to crossing the Medway by a fine lattice girder bridge of considerable size. Speed is reduced to about 20 or 25 miles per hour for the curve. Immediately afterward we pass through Rochester Station and then, after a short tunnel, through the important station of Chatham. The 20 miles and a fraction from Bickley Junction, this slow running included, will not have taken us more than 25 minutes, and our total time from Victoria will now be between 50 and 52 minutes. Rising gradients again lie ahead, at first through tunnel, to Gillingham, and then on to Rainham, after which we get a short and steep descent to Sittingbourne, which should raise the speed to 65 an hour or more. Easy gradients continue, on past Teynham and speed may rise further, if our driver is energetic, to 68 or 69 m.p.h., before we begin to breast the rise that precedes Faversham. This is climbed at a minimum of about 50 miles an hour, and then we have to slow severely, as the Margate route diverges sharply to the left just after Faversham Station. It is all but 18 miles from Chatham to Faversham, and with a good engine and driver 20 minutes should suffice. For many miles along the Kent Coast the line is practically level, the only rise of note being over the ridge on the end of which Herne Bay has been built. Before reaching this, which entails an ascent partly at 1 in 100 and will pull our speed down to about 45 miles an hour, we have run for some miles at 60. The subsequent descent should afford us a final spurt at 68 to 70, ere we sight Westgate, the western suburb of Margate. Presently we draw up in the fine new station at Margate, the last 22 miles having taken us 24 or 25 minutes. We have just about a minute in hand, and have made an excellent run over a most difficult road. Both at Margate and at Ramsgate the Southern Railway management have followed the most commendable policy of concentrating their traffic - previously arriving on different lines and dealt with at different stations - at central and well-equipped through stations. 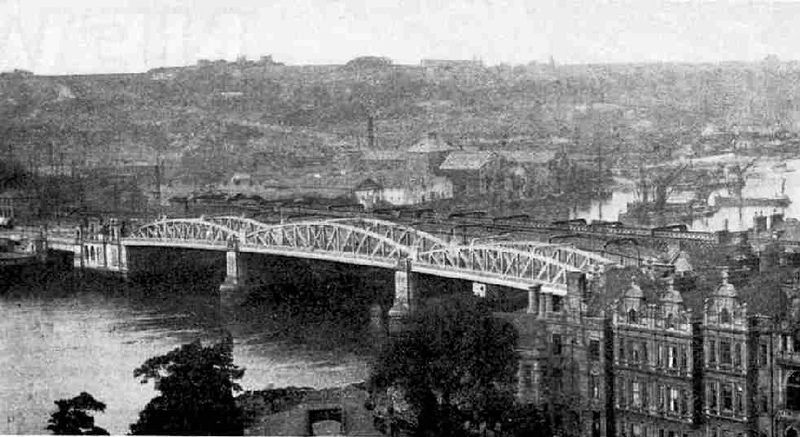 This has involved considerable constructional expense on new buildings, and new tracks to link up the old routes, but the result has been most beneficial - to the public by improved service and better connections, and to the railway by the reduction of staff and expenses that follows on concentration. We can travel on to Ramsgate by the “Kent Coast Express” if we so desire. It is 5½ miles away, and the heavy intermediate gradients, with the length of stops involved at Broadstairs and Dumpton Park, prevent an earlier arrival at Ramsgate than 5.14 p.m, practically two hours after leaving Victoria. I have a better plan for you, however. Get out at Margate, and wait for the up “Kent Coast”. It is due just before half-past five, and leaving Margate on the stroke of 5.30 p.m. will give you a non-stop run back to town in 100 minutes, bringing you into Victoria at 7.10 p.m, and thus completing your round trip in less than four hours. The down “Margate Express” passing through the outskirts of London. The locomotive is one of the 4-4-0 “L” class, No. 489. Note the upper quadrant signal in the background.